According to a reputable news source (well, the Daily Mail) the Royal Mint is casting (sic) around to find things to do when the Treasury caves to the inevitable and tells them to quit wasting everyone’s time and money by minting coins. They’ve come up with the idea of making a credit card out of real gold. They are apparently working on ways to get 18-carat gold cards to work in ATMs and, of course, at contactless terminals. The cards will have the owners signature engraved on the back (I’ve no idea why, since the card schemes are discontinuing the use of the pointless signature panels on cards) and will apparently be worth $3,000 each which (as a number of Twitterwags immediately pointed out) will greatly increase the number of fake ATMs in the streets around Belgravia after midnight. This isn’t the Royal Mint’s idea, of course. They stole it wholesale from 30 Rock a few years ago. Nowadays you’d implement the gold card as a cryptoasset that is institutionally linked to gold in a depository I suppose, but the idea of a turning store-of-value gold into means-of-exchange e-gold remains interesting: there are a great many people around the world who would prefer to pay and save in gold rather than any more modern medium. As it happens, the Royal Mint were go to have a go at this too with their RMG blockchain-based crypto asset until the spoilsports at the Treasury told them to knock it off and get back to making commemorative Brexit 50p coins. So gold cards, or cards backed by gold or cards backed by assets backed by gold? My bet is that in the long run regulated token markets will win out but I’m genuinely curious as to your opinions on this. 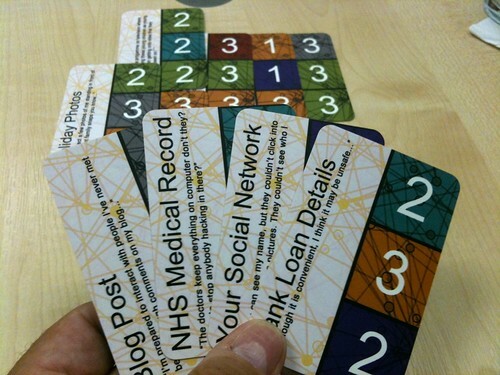 I’ve been thinking about games again, mainly because my good friend and futurist Lynette Nusbacher has been play testing a Brexit negotiation game as part of the fascinating work she does helping governments and businesses with their scenario planning. It’s a very good game with excellent mechanics. You’re basically like Furiosa driving a war rig across a radioactive territory full of bandits and you have to try to figure out which commodities to trade, which upgrades to shoot for and so on. It fun round the table and gives the kids as good insight into the Hard Brexit Option as outlined in the Daily Mail. I was thinking about it because at a recent event someone asked about games to teach children about money (now that they don’t have play money any more) and it reminded me of some things I’d written about games and payments before! 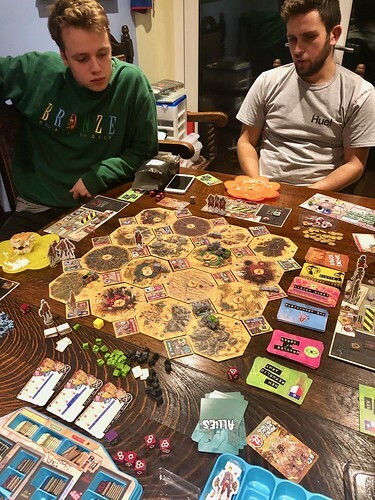 So I’ve pulled a couple of pieces together here to tell about my experiences using games to teach my kids about money, payments and financial services. 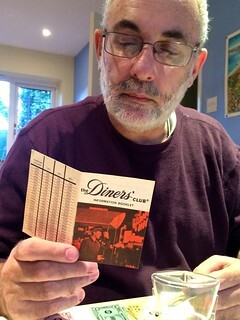 My experiences start with the time when I dusted off my copy of the “The Diners’ Club Credit Card Game”, published by Ideal in 1961. This was time when cards were far from a mass market proposition, so it looks to me as if the promotions people at Diners had had the idea of using the popular genre of the board to game to raise awareness of what exactly a card did and why anyone might want one. It’s nice game, a little random, but it works ok. It teaches you to spend for big-ticket items on your card so that you keep cash in hand for other purposes (investments etc). It didn’t take long to pick up and get going and we had fun playing it but to be honest I’m not sure if the youngsters would, unprompted, pick up and have another go. Having helped younger members of the community to understand what a card is, it was then time to move on to a more sophisticated game. I broke out “Charge It! 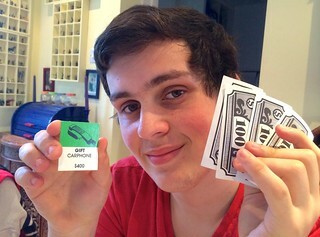 The Credit Card Game”. The original version of this game seems to date from 1972, when the combination of technological and regulatory change (ie, the introduction of the magnetic stripe and Visa’s BASE I authorisation system together with the change in state usury laws) were pushing credit cards to the mainstream. 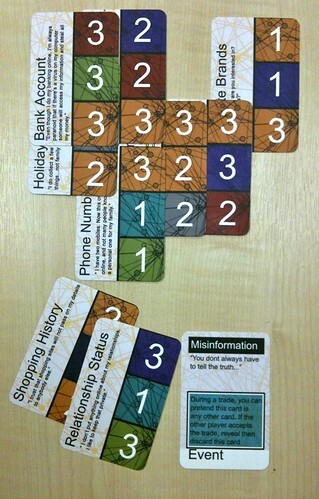 My version of the game is a later revamp from 1996, in which players collect up to four different cards (thinly disguised Visa, MasterCard, Amex and Discover schemes) and move around a board collecting stuff of one form and another. Here’s no.2 son defying his father by using cash to purchase at carphone for $400, having first had to ask me what a carphone was. When we were playing D&D (3.5e) around the same time, we were playtesting a Viking-themed variant with some house rules removing arcane magic from the game and adding a couple of new character classes (the Beserker barbarian variant has always been a great favourite of mine). Variants are a great way to have more fun so I decided to make “Charge It!” even more fun by replacing the pretend cards with real ones, but I’m sure your family would have just as much fun with the cardboard echoes. Dungeons and Dragons isn’t very good for teaching about money or payments because it involves the use of magic, which is an endogenous growth factor in a medieval economy based on scarce commodities and plentiful labour. I know politicians are fond of saying that there is no magic money tree, but on the Sword Coast, there is. So while D&D is good for getting kids interested in history and adventure, it’s not so good for economics. World of Warcraft. All parents should insist their children play this game while at middle school. My kids learned all of the key economic concepts from playing this game: supply and demand, comparative advantage, price curves, options and futures, auctions and reverse auctions, arbitrage and so on. They also learned all of the basic tools of the modern investment banker, including market manipulation, price-fixing, insider trading and shill bidding. It’s a shame they have both opted to study socially-useful STEM subjects at University instead of finance, much against my direction. Crunch. This is a card game that teaches the rudiments of banking, and it’s a f. Each player is a banker and, in essence, you have to collect asset cards so that you can make loans and investments. The really clever (and super realistic) part of the game is that the banker with the most money at the end wins: it doesn’t matter whether their bank goes bankrupt or not. If you over-extend the bank but manage to trouser the treasure before the roof falls in, more power to your elbow. Illuminati. This remains my favourite table top card game of all time and I’m glad my kids loved it too. It has a superbly clever game mechanic which means that you build up power structures based on secret societies (e.g., The Gnomes of Zurich) but you need money to consolidate the power and you basically can’t win without screwing someone else over. A much better introduction to 21st-century pseudo-capitalist corporatism than any text book. Meanwhile, back at “Charge It!”, I’ll just mention that I liked the two-track board idea and I thought it worked well in terms of game dynamics. You basically choose whether to go round an outer track or, once you have some credit cards to your name, an inside track with different kinds of interactions. The players don’t know what each other player is trying to collect so you have to keep an eye on what your opponents are buying as the game develops. We enjoyed playing this game and I think we might well play it again sometime. It was then time to return to an old favourite, Monopoly. Now, the truth is that I’ve never much liked Monopoly (it’s too random for my liking) but my kids liked it when they were small and had never played Space Crusade or Heroquest. They still play it now and then (the World of Warcraft edition is the current favourite I think). When I play tested with them, I started with our copy of Monopoly Electronic Banking edition, which replaced cash with cards some years ago and thus obtained my deputy-head-of-household seal of approval. An interesting aside: At Consult Hyperion’s tenth anniversary Forum back in 2007, the wonderful people at Hasbro very kindly donated a few Monopoly Electronic Banking sets to the event and we ran a tournament using them! 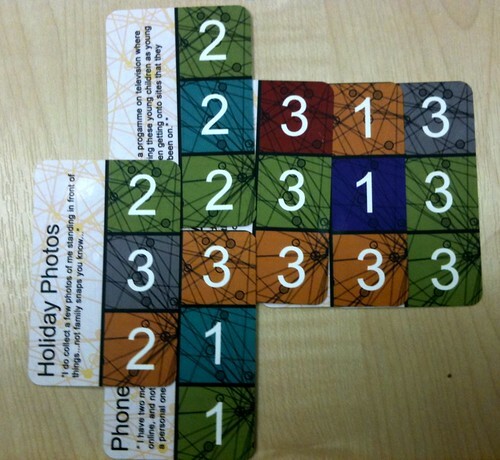 Within a couple of years, our thoughts had naturally turned to mobile and contactless, so we played a version of the game using contactless cards and NFC phones using some software that I pestered our in-house development team (the “Hyperlab”) to put together for the event. 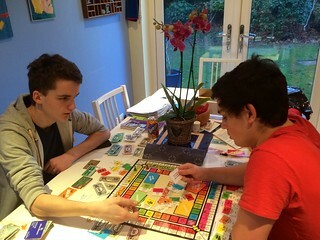 And so we meander closer to our post-crash finance landscape, with our next stop at a game of Monopoly Zapped. 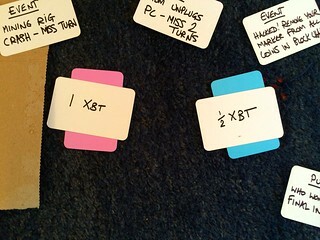 In this game, the players have cards (with no embossing any more, unlike the replacement payment cards sent to me in last month by my actual card issuers) and the “bank” is your own iPad rather than a custom piece of hardware. How right this is, on so many levels. To effect a transaction, you simply touch your “ID card” to the iPad when necessary. The family verdict on this one was very positive indeed. The contactless interface was quick and simple, it was convenient having the iPad keep track of everything and the game play zipped along at a decent pace. If your kids like Monopoly, they will like this how it is enhanced by mobile phones and contactless payments. Which brings us to the cryptocurrency era. 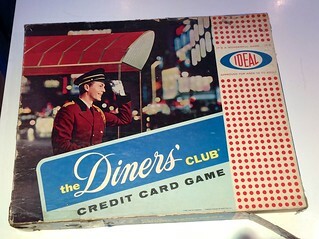 In 1961, Diners’ Club needed a game to teach people about cards. In 1972, “Charge It!” taught people about credit. 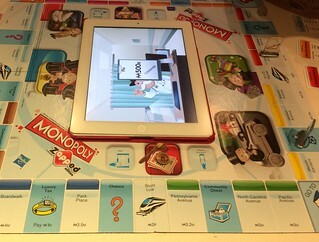 Monopoly Electronic Banking introduced a cashless economy and Monopoly Zapped the contactless economy. So I think it is time to create a game to teach people about cryptocurrency. I’m thinking either a combination of Crunch and Illuminati that builds the blockchain on the table in front of the players with some kind of Trivial Pursuit-style game to represent the distributed proof-of-work or a combination of Cluedo and Monopoly where the goal is to find the Satoshi (“It was David Chaum, in the library, with a TRS-80”) while hoarding your Bitcoins and stealing your opponents. While I was kicking around some ideas on this I remembered the fun I’d had with “The Privacy Game” back in 2012 as part of a project called VOME with the UK Technology Strategy Board. The idea of the project was to help people who are specifying and designing new, mass-market products and services to understand privacy issues and make better decisions on architecture. Part of the project was about finding different ways to communicate with the public about privacy and factor their concerns into the requirements and design processes. 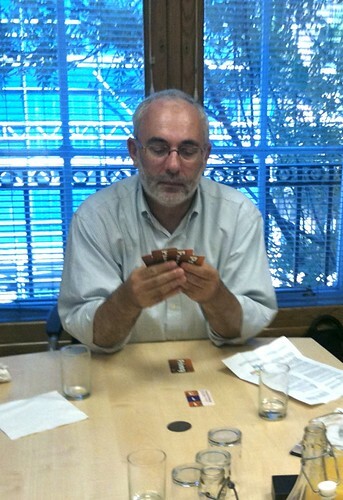 One the experiments was a card game lead by Dr. David Barnard-Wills from Cranfield University. I was involved in playtesting it. Turned out that David and his team had invented a pretty good game. Think the constant trading of “Settlers of Catan” with the power structures of “Illuminati” mixed with game play of “Crunch”. I liked it. There are event cards, that pop up each round to impact the play, and some special cards that the players get from time to time. Check out the database I ended up with in the game that my colleague and I won! I was the bank, so I was trying to collect financial data in my database but I was also trying to collect social data (purple) in my hand. I also had the idea for decoupling the market price from the underlying value with proper Illuminati-style secret market manipulation so that the players with Bitcoins will try to work together to drive up the market price. As with Crunch, the goal is to amass a personal fortune even if you bankrupt widows and orphans in the process. My original idea was that there would be something like 100 wallets, each with a two digit number (00-99) and when players create a new wallet they get to pick the next card from a shuffled deck. So each player knows which wallets are theirs but the others do not. Money gets transferred between wallets according to some kind of trading that never finished properly working out yet and the players try to nudge the game so that more money ends up in their own wallets. 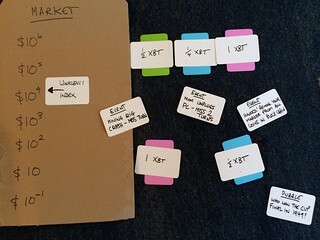 At the end of the game (when the last coin has been mined) the remaining wallets are given to their owners and the contents added up so the person with the most money wins. At any point in the game, players can prove ownership of a wallet and cash it out into $$$. 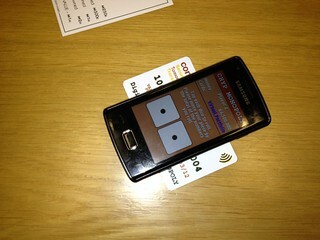 Players will be trying to hack each other throughout the game and will gang up to stop the richer players from winning. “Your PC is infected with malware that stole your password, lose all of your Bitcoins”. It’s got winner written all over it, but on the outside chance that one of you may have a better idea, I’m all ears!